This hearty, warm, healthy meal is great on winter nights. 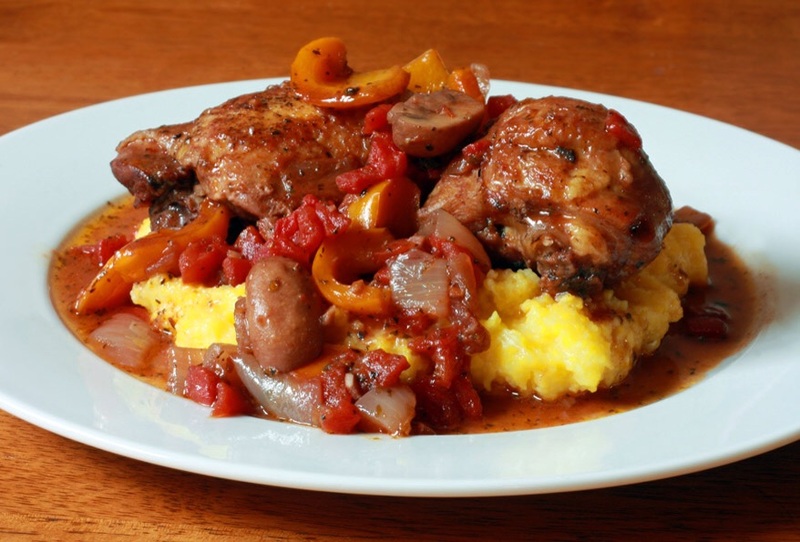 Use chicken thighs to boost the flavor, and the silky polenta is the perfect bed for pan juices. Be sure to deeply brown the chicken skin before braising to get it crisp - the fat will enhance the sauce. Enjoy! Heat olive oil in large pan over high heat. Season chicken with salt and pepper and add them to pan with skin side down. Cook for 10 minutes, turning occasionally. Remove chicken from pan. 2. Lower heat to medium and add bell pepper, onion, garlic, pepper flakes, and olives. Cook 5-10 minutes until vegetables soften. Add vinegar and simmer 1-2 minutes, stirring occasionally, until vinegar nearly evaporates. 3. Add stock, tomatoes, and chicken, tucking chicken skin side up into the vegetables. Bring to a simmer and cook over medium heat another 20 minutes. Serve over prepared polenta. Sprinkle with salt and pepper to taste, as well as fresh parsley. Enjoy!